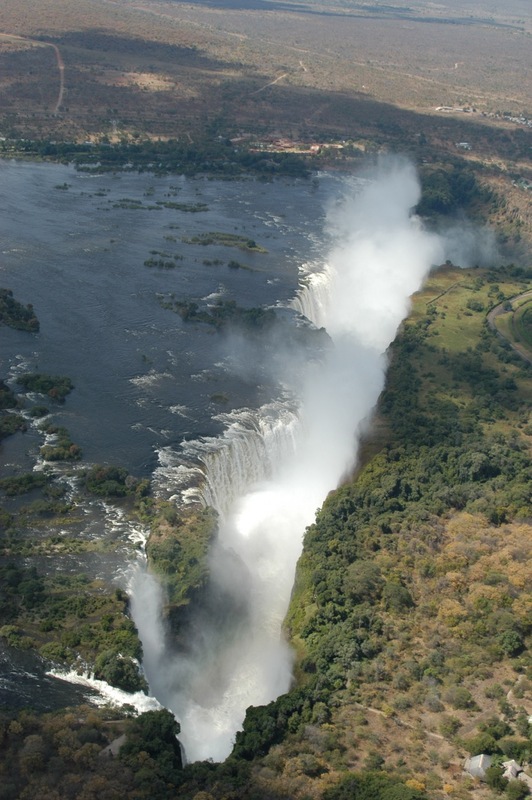 With today being the seventh day here, Victoria Falls has earned the title of our most visited place since arriving in Africa. Nowhere else have we stayed in one place for such a long period of time. We had an action packed morning with a rollercoaster ride of events to follow in the afternoon. We started the day off very early with a seven o’clock pick up from the lodge to go and ride the Elephants. It was quite an experience and we each got to ride our own Elephant as there were only seven people in the group and there were nine Elephants altogether. The Elephant trainers showed us how the Elephants responded to verbal commands and we sat on their backs for a leisurely ride through the bush for about an hour or so (the Elephant’s backs, that is, not the Elephant trainers). It was a little uncomfortable but not too unbearable and we did get to see a fair bit of game as we meandered through the bush. Of particular note was the fact that there were lots of fresh Lion footprints all about the place. The guides were telling us that they might have been hunting Buffalo earlier in the morning (the Lions, that is, not the guides). At the conclusion of the Elephant rides, we each got the chance to feed our Elephants a little treat as a thank you for the ride and we then sat down to watch the video footage of our morning’s exertions. We bought the video for $25 – well, we are tourists after all. After returning back to the lodge, we sat around for just a few minutes for our next pick up to go into Zambia for the helicopter ride. It was a brief ride, about 15 minutes altogether, but it did provide us with some stunning views of the falls. We stopped in at the Sun International hotel to have a look around and to try to change some traveller’s checks into US dollars. They would only change up $200 at a time and were going to charge a $36 commission each time so we told them what they could do with their dollars and were on our way again. Somehow, we managed to persuade the young lady who was manning the gate leading to the falls to let us through as if we were guests of the hotel (we would each have had to pay $10 to get in otherwise) and so got a spectacular view of the falls from up close. We’ve now seen the falls from just about every angle possible and we can now leave this place having checked this one remaining place of interest off the list. Bertie & Mags took the shuttle back to the lodge but there was still that one last curio purchase that I wanted to make so Sandy and I headed back to the curio markets. I don’t know what it is but I just can’t go into there and not come out again without a huge parcel full of curios and today was no exception. It provided us with the opportunity to get rid of our last few notes of various foreign currencies and this new batch of purchases will complement the previous several quite nicely – assuming the parcels ever reach England that is. The nice man at the post office was good enough to keep the doors open for a full hour after closing time to accommodate us and our last package. Along with several other regulars we’ve bumped into several times over the past week, we will miss him dearly after we leave here. Leaving here was the next thing that was foremost on my mind as the afternoon started to progress into evening. We went back to Shearwaters to call the guy who we had spoken with yesterday about booking passage on one of their northbound trucks for a ride into Arusha. Unfortunately, he would not budge on the $100 per person fee and it transpired that the trip would take almost a week to complete. Essentially, this arrangement sort of fell through and we were once again stranded with no place to go and no more accommodation arranged. It’s incredible just how quickly our fortune changes in this place from good to bad to good to bad, etc. Somewhat frantic about this latest development (it was now starting to get late and we were once again running out of options), I rang Clair from Wildlife to see if she was able to figure anything out for us. Unfortunately, she was not in the office but the young woman who answered the phone was able to help get me in touch with the truck operations manager in Harare and, to cut a long story short as I am very tired and really want to go to sleep now, I spoke with him and was relieved to learn that we would be welcome to hitch a fast and free ride (since we were already Wildlife customers) with one of their trucks due to leave Harare on Saturday morning if we could just get there to make the connection. Tomorrow morning, Andy will pick us up early to take us to the Air Zimbabwe office to book the flight for later in the afternoon. Hopefully, we will get a seat and make our connection. This evening, we enjoyed an absolutely fabulous meal in the magnificent setting of the lodge restaurant here and we all had a thoroughly enjoyable evening. Much to tell but I simply must get some sleep now.